This comprehensive set include everything you need to create amazing desserts, cookies, cakes and more. 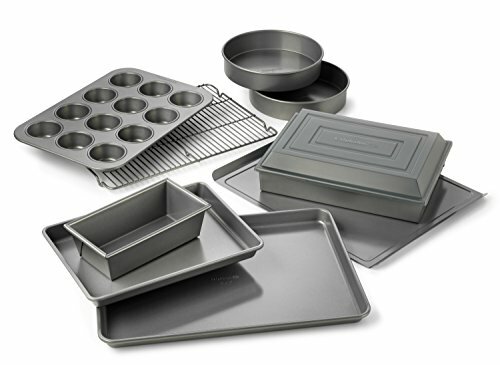 This large set includes a 12 Cup Muffin Pan, 12"x17" Baking Sheet, 14"x17" Cookie Sheet, Medium Loaf Pan, two 9" Round Cake Pans, 9"x13" Brownie Pan, 9"x13" Covered Cake Pan and Cooling Rack. The Cake Pan cover will also fit the Brownie Pan for easy storage or transportation. Calphalon Nonstick Bakeware has interlocking nonstick layers to deliver high performance release. In fact, it releases up to 2 times better than Calphalon Classic Bakeware. Now, even the stickiest baked goods can be removed cleanly for beautiful results and easy cleanup. Heavy-gauge steel core heats evenly. Dishwasher safe. Full Lifetime Warranty.